Enter your 12-Digit InstallCard Number to schedule your Installation appointment or check the status of an exisiting appointment. Would you like to find out more about what is included with the installation of your DVR-Based Camera Suveillance System? The DVR-based system you purchased comes with optional professional local installation. This installation program is truly nationwide with over 1,500 installers in all 50 states including Puerto Rico. After receiving the InstallCard packed with your product, simply activate it online or call the toll free number and one of our InstallerNet coordinators will help you activate. 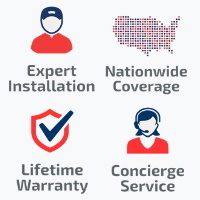 A professional electronics Installer is available in your local area at a time convenient to you! Simply follow the instructions on the back of the InstallCard when you receive it to take advantage of this great program!